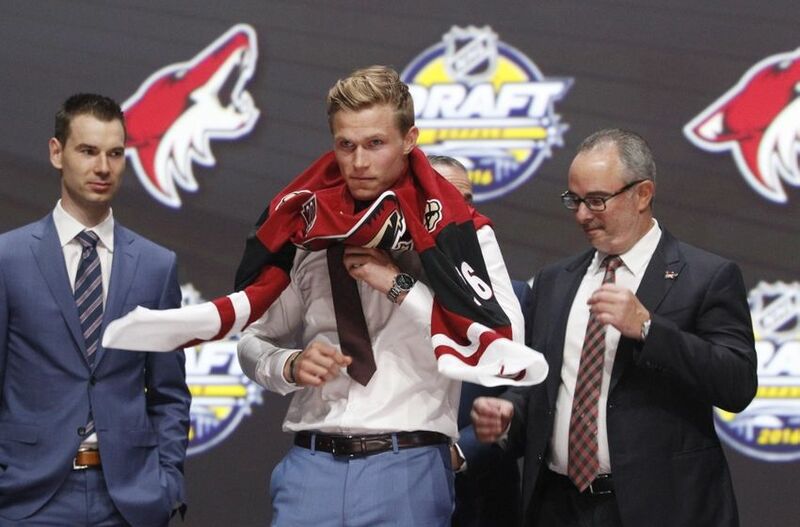 Aside from the Toronto Maple Leafs, the Coyotes look like they might have won last year’s draft. They were able to turn their picks and cap space into Clayton Keller and Jakob Chychrun – two blue-chip prospects that are undoubtedly key foundation pieces for the future of the franchise. Like last year, the Coyotes have two first round pick. Also like last year, they will be picking with the 7th overall pick – unless the trade it away, which I maintain might be the best idea. Unlike last year, however, the Yotes are highly unlikely to get a player the caliber of Clayton Keller with that #7 pick. For an organization that is filled with young talent, the best thing for the Coyotes to do with their first round picks – either or both – might be to use them as a trade chip. Trading the picks for someone that will have an impact on the team next season – say Tyler Toffoli or Matt Dumba – would be the smartest thing John Chayka could do. Finding a trade partner becomes the tricky part. There are teams that need help with both the salary cap and the expansion draft – to them, the currency of first round picks is incredibly valuable. With three picks in the top-35, there are a lot of options for the Yotes. Trading out is a very strong possibility, but as it stands right now the Coyotes own seven draft picks – here is a look at some potential targets for each of them. With the elite passing skill of both Clayton Keller and Dylan Strome, having a young sniper in the system like Tippett would be huge. At 6’2, 205lbs, Tippett already looks like a pro hockey player out there and is likely only a season away from being ready to contribute in an NHL lineup. He has a tendency to let opponents distract him – something that was very prevalent during the OHL playoffs – and he has to work on his play without the puck, but those are two things that are easily coached out of a player. What you can’t teach is hands like Tippett has. Vaakanainen is a very smart two-way defender that has good size and the potential to be a #2 or 3 guy in the NHL one day. He is very good with the puck. Smart and poised, he can lead the breakout with the puck on his stick or with a great first pass. H is a great skater and uses great edge work to pivot well when defending against the rush. He’s good with his stick and controls the gaps well – making him very hard to beat one on one. He could stand to be a little more aggressive physically. Having already played a season of pro hockey in Finland, Vaakanainen has shown an ability to play against men. When moving back down to junior – like at the U18 World Championship – he was close to dominant. The young Finn is a guy who isn’t getting much fanfare as the draft approaches but he is a very good prospect that will have a high rate of success in the NHL. It’s hard to get a grasp on exactly how John Chayka approaches the draft – especially when it comes to goaltending – but on thing is certain, the Coyotes desperately need a high-end goalie prospect in their system. With so many picks in the early part of the draft, this is the time to spend one on the guy that is the most talented netminder in the class. If DiPietro were a few inches taller, he’d be a first-round lock. He is a very quick and mobile goalie that has a great lateral push to move across his crease. He has very good positioning and wastes very little movement. His incredible reflexes and athleticism more than make up for the lack of height NHL teams are looking for in a goalie. Selecting the best goalie in the draft with their third pick would be huge for Arizona. Nolan Patrick called Shaw the “best draft eligible player he’s played against”. Shaw plays the game with a level of energy higher than most. He is a tenacious forechecker and plays with an edge to his game that you don’t usually see from a guy who is 5’9. He battles on the boards and isn’t afraid to throw his body around. He might sound like a grinding-agitator, but he’s so much more. Mason Shaw is an elite playmaker that sees the ice well enough play both center and wing. He finished the season with 94 points and his 70 primary points were second to only Kailer Yamamoto among draft eligible WHLers. Though playmaking is his primary role, he is also a threat to score thanks to a very good wrist shot. He’s a good skater with great balance that allows him to compete against bigger opponents. Studnika spent most of the season in Oshawa looking like he was never going to live up to the lofty expectations people had for him. Then the Generals traded for Mason Kohn – allowing Studnika to move to the wing – and thing changes dramatically. Studnika was Oshawa’s best forward in the playoffs contributing 15 points in only 10 games. He is a good skater, that is strong on possession and he has the ability to create scoring chances in traffic. Through two seasons in the OHL, Studnika’s offensive production has not reflected the type of tools he has. He’s got a lot of potential and is definitely worth a risk in the third round. Expect Studnika to be a big part of a good Generals team next season. One of the youngest players in the draft, Phillips is a long-term project that could pay huge dividends down the road. Heading to the University of Minnesota in 2018, Phillips is an undersized defender that has great puck skills. He is a very good skater from the blueline but is far from a liability in his own end. He moves around the ice well and has a quick stick that allows him to break up plays. Phillips isin’t an elite pffensive threat, but he definitely has the ability to quarterback a second powerplay unit in the NCAA. He’ll have to spend a lot of time in the weight room if he wants to be effective against bigger opponents in his own end. He’ll have to spend a lot of time in the weight room if he wants to be effective against bigger opponents in his own end. He’s a long way off from being a legitimate NHL prospect but given the depth of the Coyotes organization, they can afford to be patient. Maass is a true ‘throwing darts’ pick. Playing against high school competition, the 6’3 defender was dominant at both ends of the ice. The test will come next year when he attends the University of New Hampshire and will far a much higher level of competition. He’s big and good with the puck, two things that make a defender very intriguing this late in the draft.